The Chairman DRDO and Secretary, DD (R&D), Dr. S. Christopher addressing after inaugurating the three-day international conference  FIPSPHYSIOCON 2017, at Vallabhbhai Patel Chest Institute (VPCI), University of Delhi, in New Delhi on on November 05, 2017. 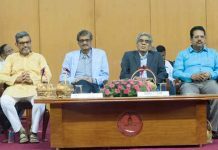 The Secretary, FIPSPHYSIOCON 2017, Dr. Madhusudan Pal, the Physiological Society of India (PSI), General Secretary, Prof. Somnath Gangopadhyay, the PSI President, Prof. Amar K. Chandra, the Distinguished Scientist & DG Life Sciences, DRDO & President Federation of Indian Physiological Societies (FIPS), Dr. Shashi Bala Singh and the Director, Defence Institute of Physiology and Allied Science (DIPAS) and convenor of FIPSPHYSIOCON 2017, Dr. Bhuvnesh Kumar are also seen. “FIPSPHYSIOCON 2017”, Conference on Human Physiology – VII Congress of Federation of Indian Physiological Societies (FIPS) along with XXIX Annual Conference of the Physiological Society of India (PSI) organised by Defence Institute of Physiology and Allied Science (DIPAS) of DRDO was inaugurated at Vallabhbhai Patel Chest Institute (VPCI), University of Delhi today. The objective of the conference is to update the scientific community about most recent advances in human Physiology in extreme environments, Neuroscience, Yoga, Sport Physiology and translational research. Ladakh: Speaking on the occasion, Chairman DRDO and Secretary, Department of Defence Research & Development Dr S Christopher emphasised on the importance of quality research and its application for tangible products and solutions to major problems. He highlighted the importance of Yoga and other approaches to improve human capabilities in difficult environmental conditions and terrains. In this context he urged the entire scientific community to utilise the facilities like highest altitude research station created by DRDO at Changla (17,660 ft), Ladakh in Jammu and Kashmir. Director DIPAS and Convener of the conference Dr. Bhuvnesh Kumar in his welcome address deliberated the importance of the theme “Integrating Physiological and Biomedical Science Approaches to Improve Performance, Health and Safety” and various topics of the conference in orations, key note addresses, plenary sessions, 16 sessions, 118 lectures and 140 posters by the 300 delegates from India, USA, UK, Kyrgyz Republic and Malaysia. President of PSI Prof. Amar K. Chandra in his presidential address highlighted the necessity of the formation of the Federation of Indian Physiological Societies by combining PSI, SAPI, APPI, ISCAP and its role to facilitate the scientific interaction between physiologists of this country with their international counterparts. Distinguished Scientist & DG Life Sciences, DRDO, President, FIPS Dr. Shashi Bala Singh in her address focused on optimisation of physical performance with interdisciplinary approaches. She also cited the unique mechanism of human body system by emphasising on different important aspects like sophisticated neural processing and energy requirements of human brain. She highlighted the collaborative approaches not only within the physiological sciences but also in a broader spectrum involving physical sciences and engineering.